Quilts and Pieces: Tonya and Finn - I got it!!!! OK, I got exactly what I need to use for my free form fans! 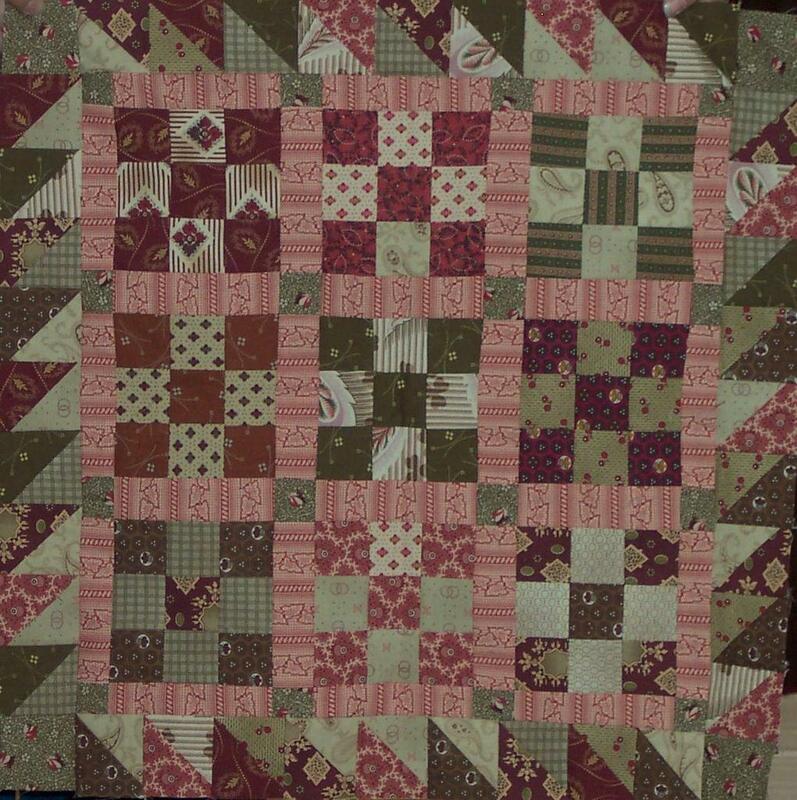 In fact it is a quilt I basted together last winter and was going to do clamshells on it, but the spray marking stuff I wanted to try didn't work, so I was going to hand mark it - well never got to it. So it is just sitting there! I'm going to free form fans on this! It is small like Tonya suggested so I can actually finish it! I think it is about 20" x 20"! Now the fun part - what color pearle cotton/crochet cotton do you think I should use? This is a neat little quilt to practice on. I like the colors. 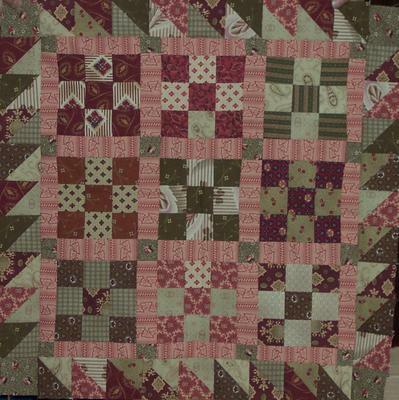 I think I would be tempted to use burgundy to quilt it..but you know where it might live, and maybe that wouldn't work. Also any of the greens would be good. PINK!!! Quilt it in PINK! It's not going to be too dark against the lights, and not too light against the darks....think pink! *pink panther theme music playing in the background"
Love your quilt. I have a little pearl cotton collection...one of my colors is that washed out, sort of greenish gray color. Is my monitor correct in showing me that there is a hint of that color in your quilt? I LOVE that washed out greenish gray color - I know exactly what your talking about. But sad to say no, what your seeing is really an off tan type color but my pic isn't that good of the color. Dawn, sorry it's taken me so long to get here! Pink would be fun, as would one of the deep dark colors in the quilt. Now don't complain about how much work it is to go over all the seam lines. They just make it harder, but I know you know that. Glad it's ready to go. I'll be ready to go soonest.